Jennifer Morrison, Senior Recruitment Consultant and Mark Monteith, Bookings Consultant have announced Louise O’Kane, Teaching Assistant as their Wirral Temp of the Month. Louise was nominated by the Wirral branch for her outstanding effort and feedback for her work at a Wirral ALN school. 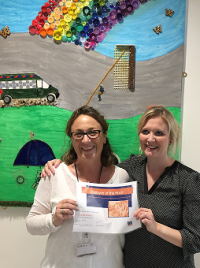 Jen was on hand to present Louise with a present and certificate to put in her portfolio. Look out for next months employee of the month.